The alms box at the restored Detweiler Meetinghouse near Roseville, Ontario. By the term, Alms (Almosen), the Mennonites of South Germany designated gifts of money which are placed in the offering box upon leaving the church at the close of a service. Twice this box is mentioned in the New Testament: Mark 12:41-44 (cf. Luke 21:1-4) and Matthew 27:6. The treasury in the Old Testament (2 Chronicles 24:6 f.; Nehemiah 12:44 and Nehemiah 13:4, 9) was intended to receive gifts for divine worship and particularly for the upkeep of the House of God. According to 1 Corinthians 16:2 the Apostle Paul advised the churches at Galatia and Corinth to gather some gifts of money on each Sabbath, and to lay it aside until he would come to use it for the needy brethren in Jerusalem. Thereby he laid the foundation for Sunday alms in the Christian Church. In the early Mennonite settlements in Pennsylvania (1683 ff.) and Ontario (1786 ff.) 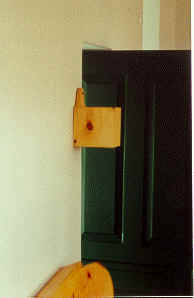 the custom of placing "alms" boxes at the exits of the meetinghouses was continued, and is still followed in the more conservative congregations there to this day. However, it also became the custom in many congregations in these regions and in daughter settlements, as is in general practiced by all congregations of the (Old) Mennonites, Amish Mennonites, and related groups, to receive an "alms offering" for the poor of the congregation at each communion service in connection with the observance of the ordinance of feetwashing. This fund is traditionally administered by the deacon, who is thought of as the custodian of the "alms" fund. Hege, Christian and Christian Neff. Mennonitisches Lexikon, 4 vols. Frankfurt & Weierhof: Hege; Karlsruhe: Schneider, 1913-1967: v. I, 36. Zijpp, N. van der. Geschiedenis der Doopsgezinden in Nederland. Arnhem: Van Loghum Slaterus, 1952. Reprinted: Delft: Familie Van der Zijpp, 1980: 114-115, 123-125. Neff, Christian, Nanne van der Zijpp and Harold S. Bender. "Alms." Global Anabaptist Mennonite Encyclopedia Online. 1953. Web. 25 Apr 2019. http://gameo.org/index.php?title=Alms&oldid=132622. Neff, Christian, Nanne van der Zijpp and Harold S. Bender. (1953). Alms. Global Anabaptist Mennonite Encyclopedia Online. Retrieved 25 April 2019, from http://gameo.org/index.php?title=Alms&oldid=132622. Adapted by permission of Herald Press, Harrisonburg, Virginia, from Mennonite Encyclopedia, Vol. 1, p. 66. All rights reserved. This page was last modified on 17 August 2015, at 17:37.